World Gathering Less Than A Month Away! 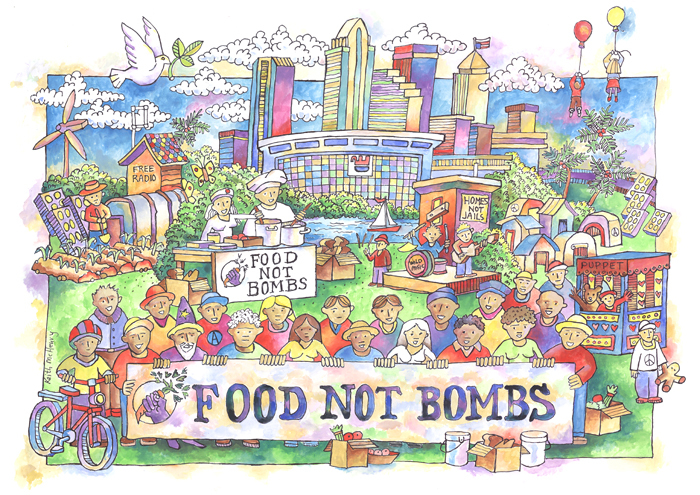 That’s right: August 20th, the first day of the Food Not Bombs World Gathering is just around the corner! We’re hard at work in Tampa planning all entertainment, education, and other events that will be taking places during that week in the Tampa Bay area. Above all, though, we are working on gathering the materials and supplies necessary to make this event successful. We are building the capacity to not only share food with the Tampa community throughout the week of the Gathering, but the protestors that will be showing up for the Republican National Convention next week. Dry and canned food, particularly beans, rice, potatos, pasta, canned veggies. fresh fruit and veggies, and lumber and other building materials for a stage and other structures we’ll be working on for World Gathering events. And finally, here’s a schedule of some of the siginificant events for the Food Not Bombs Gathering – all events are free! Kick-off event with food, music, puppet shows, and kick-ball at Voice of Freedom Park, 5 pm. Wednesday: Workshops on protest theater, clown bloq, medicinal plants, permaculture, gardening, canning, and preserving, various locations. Also a late night scavenger hunt! Saturday, August 25th: Free all-ages show at Market on 7th in Ybor, featuring David Rovics, Vermin Supreme, and more! Space will be available at Voice of Freedom Camp during the event for campers and other options may become available as the event gets closer. Please contact tampafnb@gmail.com if you want to help with supplies for the event or want to help put together an event for the World Gathering.